03.26.2006 - "EEK!! A SNAKE IN MY HOUSE!!" *faint - This scene plays itself out every day in America. A hapless homeowner turns the corner into the hall, spots a snake lying about, lets out a high-pitched scream and collapses, and then his wife has to come and resuscitate him, nurse him back to health, and send him off to counseling to get over this traumatic event. The wife then gets the broom and sweeps the snake out the door, and the problem is solved. I deal with snakes inside homes almost every week. I've seen several different species. In general, the more common the snake, the more likely it is to get inside the home, so the Black Racer, which is very common, is often found inside. However, factors other than commonality matter as well. Some snakes that are good climbers are likely to climb up and into the openings that lead into the home. Rat snakes are a good example. And if you've got rats in the attic, that will only serve as an attractant. The single most important factor though, seems to be size. The smaller the snake, the more likely it will fit into tiny gaps. Thus, tiny snakes, such as Ringneck Snakes, are very common inside homes. These snakes aren't necessarily trying to get into the home for any reason, but like any animal, they explore their environment, and if there's a small gap, say under a door, they may slither in, and then become lost inside the house, unable to find their way out. The most snakes I ever found inside a house was 18, because a Yellow Rat Snake had laid its eggs somewhere, perhaps in the attic or a wall, and they all hatched. So, how do you get a snake out of the house? Well, if you see it, you can call a wildlife removal pro like me to remove it. If you know a lot about snakes and can identify and handle them, you can catch it and remove it yourself. You can sweep it out the door with a broom, perhaps, or trap it under a box or jar and then slide paper underneath and carry it outside, or drape a towel over it and wrap it up and let it go outside. However, many of these methods will fail, especially if the snake is too fast and it slithers away. Then what? Snakes can live for a long time, and they can fit into tiny spaces. I get many calls for snakes inside homes, and of course when I arrive, there's no snake to be seen, and the house is just filled with hiding places. The homeowner is frustrated, and is uneasy living in a house with a snake lurking somewhere. In cases such as these, I simply search and search, very diligently, until I find it. If I cannot find it, I simply set several snake traps inside the home, and eventually, the snake is caught. In some cases, the snake is never found. I assume in these cases that the snake either got back outside again, or slithered into some God-forsaken impossible to find spot, probably inside the wall, and will never emerge. I once got a call about a dead animal odor, and the smell was very faint, but eventually I found the culprit - a 14-inch dead Garter Snake, that was down inside the slide track of a sliding closet door. How do you keep snakes out of the house? It's a simple matter of finding and sealing every possible entry point leading into the house. When I do a snake prevention job, I seal up all of these little gaps. If there's a gap underneath a door, for example, I install new weather stripping. I seal the gaps around pipes, siding, ground vents, etc. It's always good to seal your home against pests, snakes included. 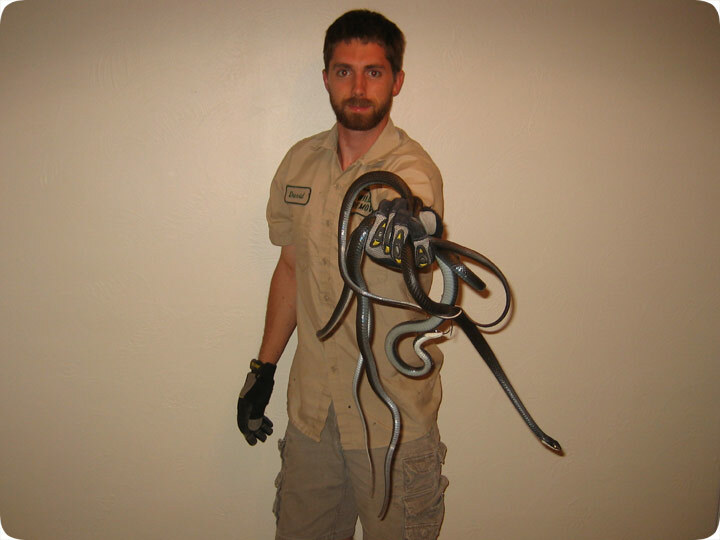 Or else you might end up with four black snakes in your hand, removed from your bed and desk and pantry and couch, such as I did in the above photo.